← The Anatomy of a Rivalry, The Second Stanza, The Transaction….. 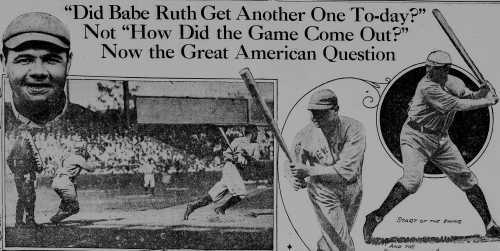 The Anatomy of a Rivalry, The Third Stanza, Into the Abyss…..
Babe Ruth’s trade to the New York Yankees, marked the second time in five years that the Red Sox had traded someone who was arguably the best player in the American League. Yet the trade of Tris Speaker in 1916 did not adversely effect the Red Sox efforts, as they won the World Series in both 1916 and “18′. However, with Babe Ruth trading in the pinstripes of the Boston Red Sox for the pinstripes of the New York Yankees; the turn around for both franchises was profound, immediate and everlasting! In 1920, Babe Ruth shattered his record of 29 home runs in a single season when he hammered 54 of them. He led the league in HR, RBI, Runs Scored, On Base Pct, Slugging Pct and Walks and did it all while hitting .376. The Yankees finished with 95 wins (the most in their history) but were three games back of the White Sox in third place. Their tide was turning. The Red Sox were 72-81, finishing in fifth place and suffering their worst season since 1906. 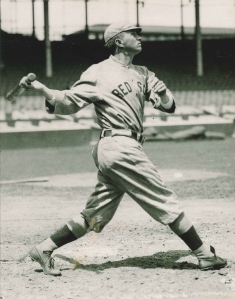 Harry Hooper led the team with seven home runs, added 53 RBI while hitting .312; a solid admirable season for the future Hall of Famer but in spring training 1921, he was traded to the White Sox. Their tide was turning as well. 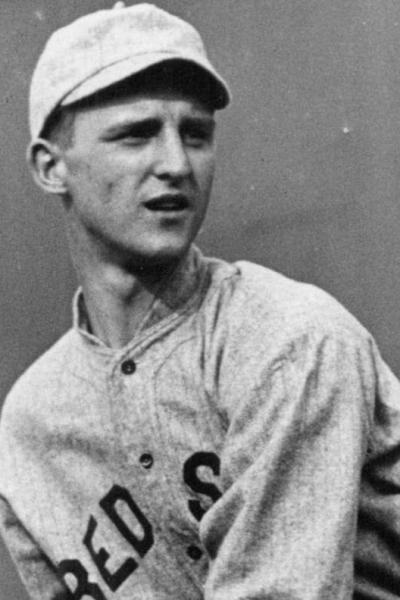 Herb Pennock was 16-13 in 1920, the only Sox hurler with a winning record. He was traded to the Yankees in January of 1923. 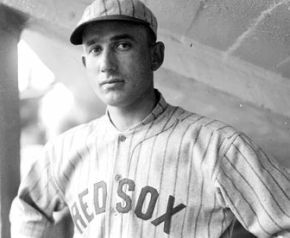 The 26-year-old southpaw Herb Pennock emerged as the ace of the Red Sox pitching staff, but his days in a Red Sox uniform were also numbered. The 1921 season brought even new heights for Babe Ruth and the Yankees. He hit 59 home runs, knocked in 171 of his mates and hit two points higher at .378, leading the Yankees to their very first pennant. (And, he also led the league in all the same categories as the year before.) They lost the World Series to the Giants, with whom they shared the Polo Grounds, but their tide had decidedly turned! 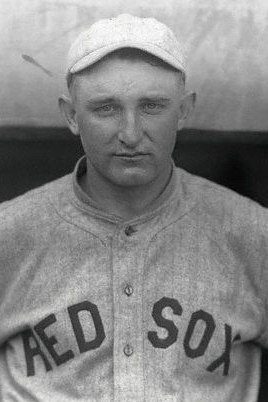 Carl Mays who was the winning pitcher for the Red Sox in the deciding game of the 1918 World Series, was the ace of the Yankee staff in 1921 going 27-9. 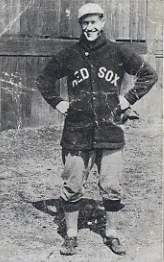 Twenty-0ne year old Waite Hoyt, acquired from the Red Sox in December of 1920, was the number two man on the ’21’ pennant winning Yankee staff, winning 19 games. The Red Sox finished a few games better than the previous year, their tide was still turning. It is not my intent to chronicle the exploits of Babe Ruth while with the Yankees. That you can do yourself with one click here. Take note of all the bold numbers, those indicate he led the league in that category. Suffice to say that if you recall what Barry Bonds did on steroids from 2000-2004, that was Babe Ruth on hot dogs and beer from 1920-1933! The Yankees repeated as American League champs in 1922 but were swept by the Giants in the World Series. The following year marked the opening of the “House that Ruth Built” and in their first season in Yankee Stadium, the Yankees won their third successive American League pennant, only this time they capped it off by beating the Giants for their very first World Championship! 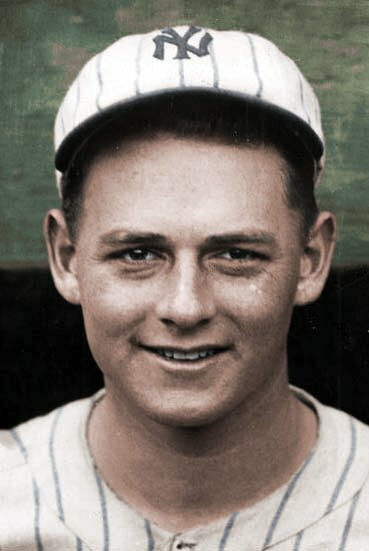 “Bullet” Joe Bush acquired by the Yankees from the Red Sox in December 1921, won 19 games for the Yanks in 1923. “Sad” Sam Jones was acquired by New York in the same trade with Boston that landed them Joe Bush, he was 21-8 with the 1923 Yankees. By this time, the 31-year-old (old for a player back in the day) Carl Mays was relegated to the Yankee bullpen but he did manage to go 5-2 in 81 innings of work. Herb Pennock was the winning pitcher and Sam Jones got the save in the deciding game of the 1923 World Series, a game in which Babe homered, delivering to New York their first ever World Championship! Pennock, Hoyt, Bush, Jones and Mays were a combined 81-40 for the 1923 World Champion Yankees. Mays, Bush and Jones were a combined 52-33 in the Red Sox shortened World Championship season of 1918. 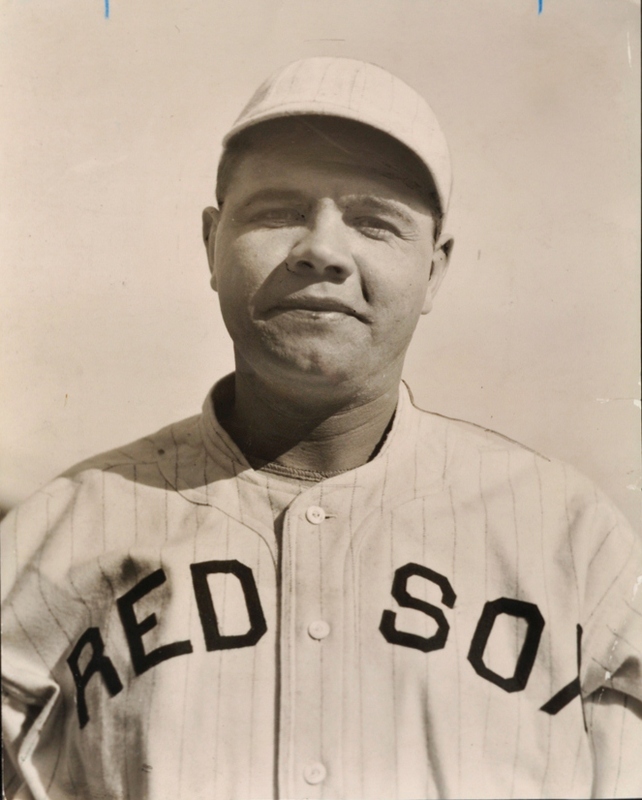 Oh, and the other guy in that ’18’ Boston rotation, Babe Ruth at 13-7. From the time the Yankees acquired Babe Ruth until his final year with them in 1934, their record was 1,405 wins and 895 losses (.611). From the time the Red Sox sold Babe Ruth to the Yankees until he left them in 1934, their record was 891 wins and 1,403 losses (.388). What more need be said ? Well you could say the Yankees won seven pennants and four World Series while the Red Sox reeled off nine last place finishes, including six in a row! And you could say that the Yankees displaced the Red Sox as the premier franchise in all of baseball! And you could say that the Red Sox stumled into the abyss of their “Dark Ages”. This entry was posted in Fenway Park Baseball and tagged Babe Ruth, Babe Ruth Home Run Records, Bullet Joe Bush, Carl Mays, Fenway Park, Harry Hooper, Herb Pennock, Red Sox, Red Sox/Yankee Rivalry, Sad Sam Jones, The Babe, The Babe in Red Stockings, Tris Speaker, Waite Hoyt. Bookmark the permalink. 1 Response to The Anatomy of a Rivalry, The Third Stanza, Into the Abyss….. It always could be worse….Imagine living in these days and cheering for the Sox…Yikes!